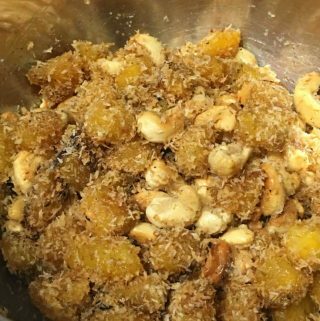 South Indian Kerala style nendrapazham recipe with coconut and cashews is a simple and delicious sweet dessert or snack made using ripe plantains, which is popular in Kerala, especially known as a Malabar style sweet snack using ripe plantains. The sweet ripe plantains are chopped and stir fried with grated or shredded coconut and fried cashews. Nendrapazham is the malayalam word for ripe plantains and sometimes this is referred as nendram pazham or nendran pazham or simply pazham which means banana. We make this simple and delicious stir fry using ghee, which is clarified butter. Using ghee is very necessary for the most delicious flavor of this nendrapazham recipe which is so simple to make. It is also known as pazham nurukku with coconut in many places of Kerala. 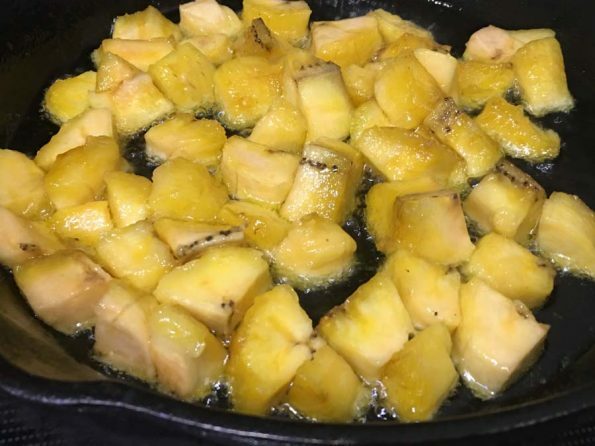 Make sure to use good quality ghee and good quality ripe plantains (which is not too ripe and mushy, but ripe enough to be sweet and delicious) for the best results. We use a little cardamom powder in this recipe to give it a wonderful flavor to the plantain stir fry. 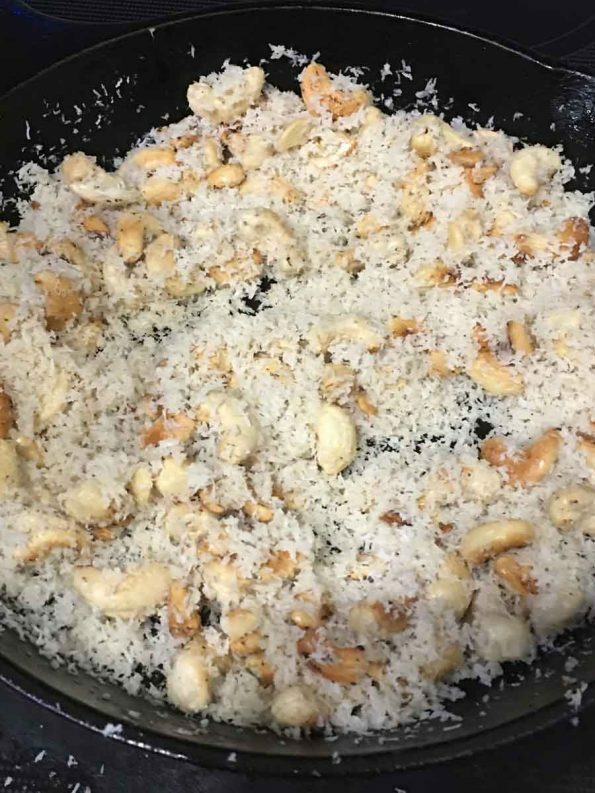 This simple and easy to make, delicious stir fried plantains with coconut and cashews make a tea time snack which can be enjoyed with a cup of coffee or milk, or you can enjoy this as a quick and easy breakfast using ripe plantains. 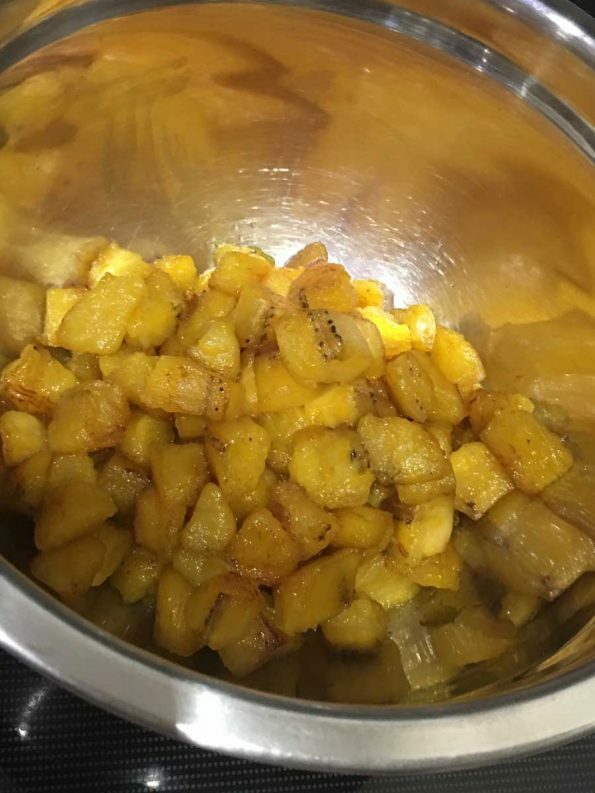 Though this is a sweet dessert kind of recipe, you can always adjust the amount of sugar as you would prefer and even if you completely skip the sugar, this is still delicious for a sweet breakfast as the ripe plantains are naturally very sweet. 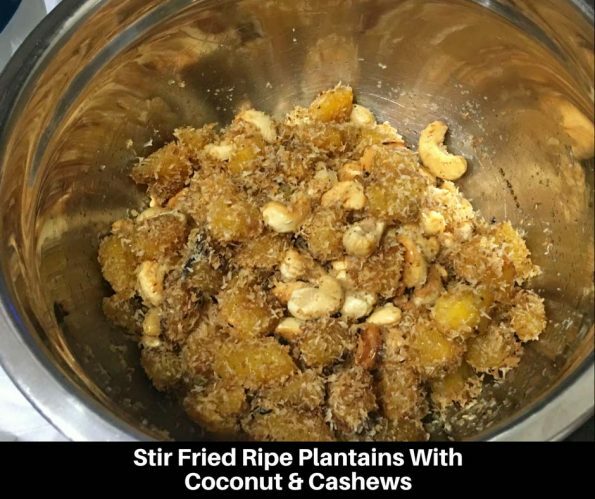 So here is how you can prepare this easy and quick sweet snack using ripe plantains following this easy sweet plantain stir fry recipe with coconut or nendrapazham recipe using coconut and cashews. This nendrapazham recipe or stir fried ripe plantain banana recipe with coconut and cashews make a simple and sweet South Indian Kerala style snack or breakfast. This is also known as pazham nurukku. Wash, peel and slice the ripe plantains into small sized pieces. You can first slice them lengthwise, then slice each piece again lengthwise and then chop them into small even sized pieces. Keep this aside. In a large pan, heat 2 tablespoons of ghee and add the chopped plantains in a single layer. Make sure not to overcrowd the pan as all the slices won't get cooked the same if you don't lay them in a single layer. 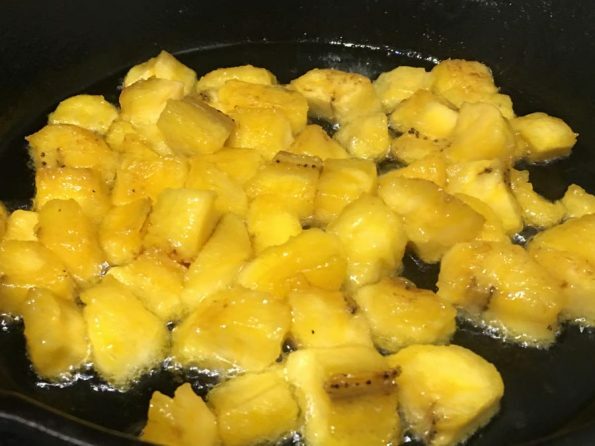 Roast the plantain slices for about 2 to 3 minutes or until they are bright golden yellow in color. You may also wait until they are lightly browned if you wish. Gently flip the plantain slice using a good quality spatula (if the pieces are sticking to the pan, it usually means they are not roasted yet so you will have to wait for little more time until they are roasted and come off the pan easily) and also roast the other side of the slices too until golden yellow in color. You may add a little more ghee if needed. Once the plantain slices are well roasted, transfer the roasted slices to a large bowl. 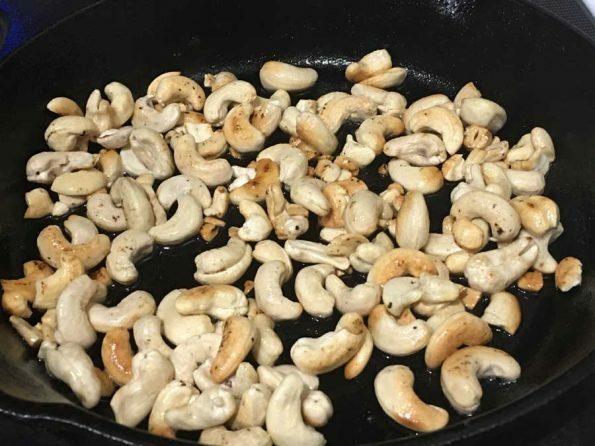 Add 2 more tablespoons of ghee to the same pan, add the cashews and lightly fry the cashews until golden brown. Add the coconut and cardamom powder also to the pan and heat the mixture for 1 more minute. Add the coconut cashew mixture to the roasted plantain slices, add the sugar and mix everything well using a spoon. Serve the delicious sweet and roasted plantains with coconut and cashews for a yummy snack or breakfast as you wish. 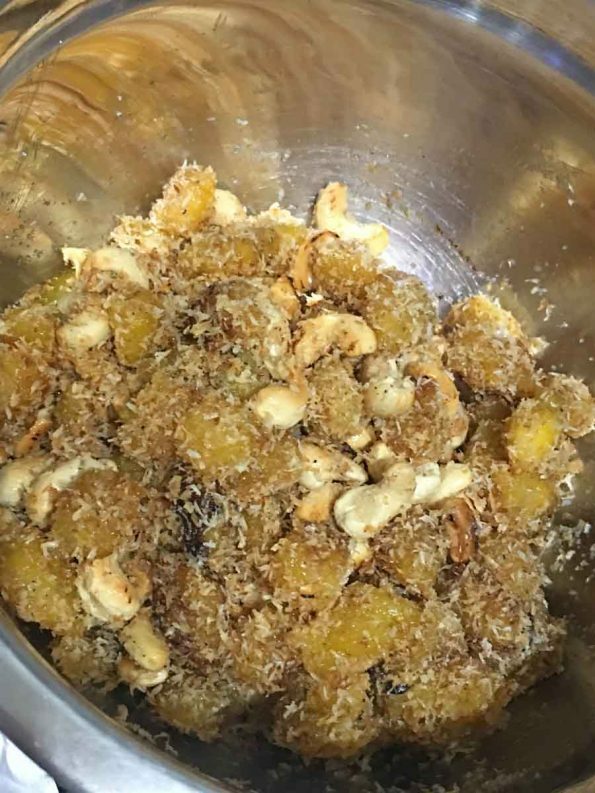 You can also fry few raisins along with the cashews in the ghee and add them to the snack if you like. You can adjust the amount of coconut and sugar as you would like. 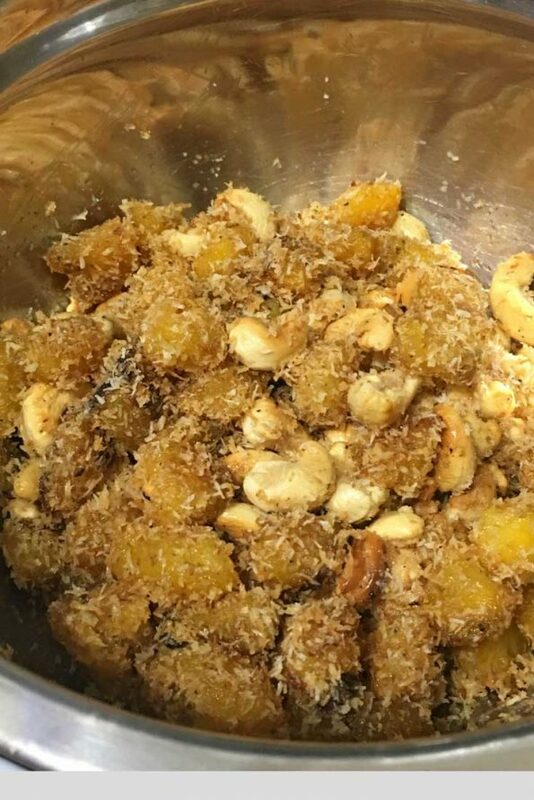 Hope you found this post on nendrapazham recipe with coconut or stir fried plantains with coconut and cashews helpful in making easy and tasty snack using ripe plantains.